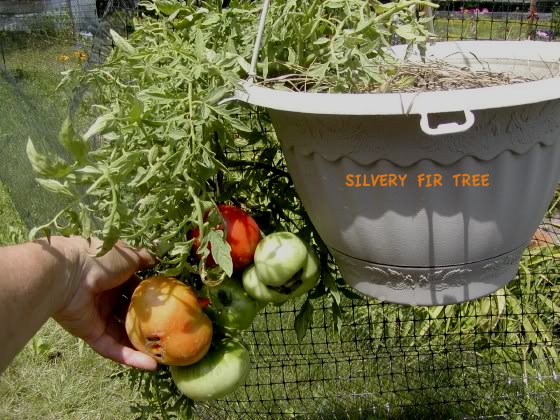 Tomatoville® Gardening Forums Index > We're Here For The Tomatoes!™ > General Discussion > Very compact tomatoes with apx. 3" fruit? Very compact tomatoes with apx. 3" fruit? The largest very compact, early tomato that I have grown is "Linda," which is typically a tidy 15"-18" plant with mostly 2" fruit. (Available at Heritage and from Nikitovka Seeds in Ukraine.) They are about the size of winter Campari, and are very good tasting. I start these indoors around the first of February and they produce ripe fruit mid-late May. I put one or two of these in a 12" (2.4 gallon) hanging basket. But I'd also like something a bit larger that I can still start super-early. Color doesn't matter. Needs to be early and a very compact determinate plant -- so that it won't outgrow my lights or cold frame. Any candidates that you can suggest? Have a look at the varieties from the dwarf project GG. Not sure about dtm for them but you would find some of the plant and fruit size you are looking for within that lot. There is also Sophie's Choice that is very low to the ground, bushing out instead of up. Nice sized good tasting tomatoes. See http://t.tatianastomatobase.com/wiki/Sophie%27s_Choice for more info and pictures. Cold Set and Siletz are both very small plants no more than 2 ft tall, fruit size 2-3 inches? That is what I got growing in 5 gallon pots. KangarooPaw brown/green/red are about the size you are looking for and delish. cherry. It was my earliest last year. 3 plants in a 5 gal grow bag on my kitchen deck. I would recommend Mongolskiy karlik and Sarayev Shtambovyi. Plants are really compact and low, suitable for a cold frame. Fruit red, tasty, slicer about 2 oz. GG, I agree about Sophie's Choice. Here's one grown by my Uncle Lee (He's 94 and still walks a mile a day). These were grown in a Grow Box 4 plants to the box and did fine. That is an interesting picture of the 4 plants in an earthtainer! I will give Sophie's Choice a try. I did a little experiment a few years ago, starting seeds from 8 or so determinates looking for small plants. Of those I planted, only Cyrill's Choice was a small plant. I grew CC out, but it produced very small fruit -- not what I'm looking for. Sophie was in the test, but it was not particularly a small seedling, so I never grew it out. Of the early, small plants that I have grown, the one with the largest fruit is Bush Early Girl. I'm going to start some of them, also. Another one that is no longer available is Burpee's Pixie II hybrid. Of the two dozen or so project dwarfs I've grown, the smallest + earliest was Dwarf Arctic Rose. It was about 3' tall and produced some 3" tomatoes, but very few. This year I've started Iditarod Red and Yukon Quest as earlies. My earliest + best yielding dwarf (combined) is Dwarf Pink Passion. But the dwarfs I've tried are really not well suited for a hanging basket. My preference for a basket type is that I can easily move it to my enclosed back porch for a couple of days if we have a cold snap. So I'll see how it goes -- and thanks for the suggestions! Last edited by saltmarsh; March 12, 2019 at 11:30 AM. I should have mentioned Silvery Fir Tree. You could grow that in a hanging pot and get some larger tomatoes, but they are very acid and not too many people like the taste. I only grew them one year. Lovely foliage, though it doesn't show up well in the photo.